A bronze medal for Frenchman Simon Gauzy eight years ago in Singapore but that is the only podium finish for Europe in two editions of the Youth Olympic Games. Charged with restoring honour, Sweden’s Truls Moregard and Ioannis Sgouropoulos of Greece head the challenge in the Men’s Singles event; in the counterpart Women’s Singles competition Serbia’s Sabina Surjan and Azerbaijan’s Ning Jing are very much names on whose shoulders hopes rest. Truls Moregard and Ioannis Sgouropoulos contested the final of the Junior Boys’ Singles event at the European Youth Championships in Cluj Napoca in July, the latter, emerged the winner. The win endorsed the quality of Ioannis Sgouropoulos, he secured the title for a second consecutive year having won in 2017 in Guimarães. However, the success was against European opposition; time and again in the two editions of the Youth Olympic Games, Europe’s nemesis has been Asia. The question posed for Ioannis Sgouropoulos, is can he succeed against Asian adversaries? It is a question that Truls Moregard has answered. Nine months earlier at the 2017 ITTF World Junior Championships in Riva del Garda, he reached the Boys’ Singles final. Significantly en route to the final beat Japan’s Yuto Kizukuri, before following with success against China’s Xu Haidong and Niu Guankai. Eventually, a third Chinese adversary, Xue Fei, ended adventures. Such results surely bodes well for Truls Moregard’s challenge in Buenos Aires. Now can the other leading European names on duty in the South America city, emulate the Swede. Can they beat Asian opposition? The name of Romania’s Cristian Pletea comes quickly to mind, the recent winner of the Junior Boys’ Singles title at the recent Europe Youth Top 10 tournament in Vila Real; can he raise the level a degree when facing Asia’s elite? Arguably, the situation is even more acute in the Women’s Singles event. 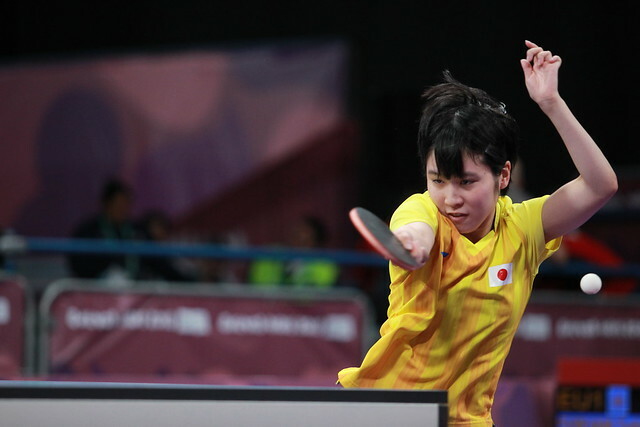 At the recent Europe Youth Top 10, Sabina Surjan completed the tournament with a perfect record; likewise on duty in Buenos Aires, Romania’s Andreea Dragoman finished in second place, Poland’s Anna Wegrzyn was fourth. Similarly, at the European Youth Championships, Azerbaijan’s Ning Jing successfully defended her title; like their male counterparts can they move a gear higher and challenge Asian adversaries? In Buenos Aires, in the Men’s Singles event, Truls Moregard is the no.3 seed, Ioannis Sgouropoulos is the no.8 seed; Cristian Pletea is one place lower. Meanwhile, in the Women’s Singles listings, Sabina Surjan is the no.5 seed, Anna Wegrzyn the no.11 seed, Andreea Dragoman the no.13 seed. Further down the list, Ning Jing appears at no.18; a position from she could well upset higher rated adversaries. Later in proceedings in the Mixed International Team event Truls Moregard partners Sabina Surjan, Ioannis Sgouropoulos joins forces with Nadezhda Bogdanova of Belarus; Ning Jing allies with compatriot Yu Khinhang, Anna Wegrzyn forms a partnership with Austria’s Maciej Kolodziejczyk. Notable pairings, equally worthy is the combination of Cristian Pletea and Andreea Dragoman, could national pride for a nation steeped in success be a telling factor? In the past such passion has more than once brought glory to Romania.